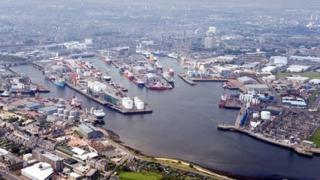 Aberdeen Harbour could expand to a site in nearby Nigg Bay, it has been announced. It has emerged as the preferred option after a feasibility study was launched in September into the port's plans to increase its capacity. Two other sites - North Beach, immediately to the north of the harbour, and south of Cove Bay - have been ruled out. The Nigg Bay option will now be subject to further detailed analysis. Harbour management are looking to expand to deal with subsea-related activity involved in the decommissioning of offshore installations, an upsurge in shipment of oil and gas equipment to key markets, and significant requirements for the support of offshore wind developments. The harbour offers trading links to more than 40 countries, and is a major port for the oil and gas sector in the North Sea and west of Shetland. Aberdeen Harbour currently handles about five million tonnes of cargo, worth about £1.5bn a year, for a wide range of industries.